Sativa or Indica: Which Cannabis Strain is Ideal for You? Cannabis is a robust, vigorous and fast-growing plant which responds very well to crop optimisation techniques such as: pruning; propagation via cuttings; hydroponic cultivation and more. In a previous article we looked at the so-called “destructive” techniques like pruning, super-cropping, etc, and in this article we’re going to talk about a very useful technique both for indoor and outdoor growers: Training or tying down, often referred to by cannabis growers as LST (low stress training). This technique originated in the agricultural sector, where for generations vineyards and orchards have been cultivated using a variety of training techniques, to facilitate harvesting and improve the productivity of the crop. The most common use of training is to limit the height of our cannabis plants, whether it’s in order to make sure they stay at a discreet height and out of sight below a wall or fence when we’re growing outdoors or to keep the tops of the plants at the proper distance from our indoor grow lamps, we can bend and them to manipulate their structure, without needing to top them or cut the growing tip. It’s a technique that favours the development of secondary branches and maximises light exposure to the lower parts of cannabis plants, which will encourage the formation of buds all over the plant, rather than one huge central cola. This is a definite advantage in situations with high humidity during the flowering period, as growing one enormous bud makes the plants much more prone to mould or bud-rot than if we develop a larger quantity of smaller flowers, evenly distributed over the plant. Another benefit of an even light coverage is that all the buds will be ready at the same time, as opposed to untrained plants where the upper flowers mature before the lowers. This allows growers to work more efficiently at harvest time, cutting down whole plants, rather than having to remove the tops then come back later for the lower buds. What happens when we train cannabis plants? Thanks to a phenomenon known as phototropism – when plant growth responds to light stimulus – the parts of the stem that are now shaded will start to produce more growth hormones, called auxins, which increase cell elongation on the shady side of the plant, with the effect of directing the apex, or growing tip towards the light once again, while the lower branches will now be able to take advantage of more energy and light. Once the secondary branches are well formed thanks to improved light exposure, we can begin to bend them as well, directing energy to the tertiary branches, or we can decide to begin flowering at this point, depending on the available surface area and the number of plants being cultivated. If this training is repeated as necessary throughout the growth stage, and continued into the stretch period (at the beginning of flowering), this method allows us to obtain a more homogenous and even canopy of flowering plants, similar to SCROG (Screen of Green) cultivation, filling the grow space to the maximum with perfectly illuminated flowers, rather than growing plants upright, where the lower buds won’t mature as well due to lack of light. 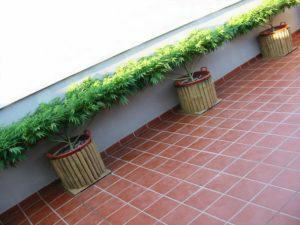 It is also a method widely used by outdoor gardeners who want to grow discreetly on balconies or patios, where the height of the plants must be controlled to keep them out of view. Most growers start to train their cannabis plants once they have between 3 and 6 nodes, or pairs of leaves. At this young stage in the plants development its stem is pliable and easily bent over without any risk of breaking, but as the plant gets older the stem thickens and grows stiffer, making training impossible. Of course, we can continue to train the secondary or tertiary branches as the plants grow, and a major advantage of LST over pruning is that we can train the plant all the way through flowering if we need to control height, whereas pruning at such a late stage in the cycle would stress plants, slow development and delay maturity. The natural flexibility of cannabis branches makes it relatively easy to bend the stem and branches without halting growth, as long as we’re careful. Using a string, we can anchor the top of the plant a few nodes below the growing tip, to a fixed point nearby. In many cases, we can attach the string to the rim of the pot, or a stick or hook pushed into the soil. We begin by lightly bending the stem, and gradually increasing the tension day after day, until we’re happy with the position. Pay attention to how the plant reacts, don’t over-tighten the string and remember that the flexibility of the branches can vary from one plant to another. To achieve the best results from using this technique, we must follow a few simple rules. Firstly, don’t use string that’s too fine and which could act like a cheese-wire, cutting or constricting the branch as tension is applied or as the branch grows. Soft plastic ties or any other flexible, thick material may be used to attach to a branch, thus avoiding damage to the plant. Using thick, coloured cord indoors makes sure it’s easily visible, helping us to avoid snagging ourselves or our equipment as we work around the garden, an accident that could otherwise easily occur when we’ve got something resembling a spider’s web made up of a multitude of ties, strings and supports surrounding the plants. Of course, in a guerrilla grow situation we’ll want to do the complete opposite, and use neutral-coloured string that won’t catch the eye and possibly give our plants away. To get the most out of plants, training is best done in the evening, or just before the lamps are turned off in indoor grows, leaving the rest of the night for the plants to recover, we can usually see how plants react the following day, as they once again turn their growing tips towards the sky and prepare to enjoy a new sunny day. A practical and effective way to train cannabis plants is to use a trellis or mesh to separate and support the branches. This can be done in a way very similar to SCROG growing, with the trellis situated horizontally above the plant and the branches weaved through the holes to hold them in place and sculpt the plant according to the growers needs. The trellis can also be placed vertically, allowing the grower to train the plant in two dimensions, just like espalier fruit trees, a great way of supporting plants and saving space in the garden. A third method of using trellis that’s very popular in cannabis cultivation is to employ a tubular trellis entirely surrounding the plant. This is a method favoured by outdoor growers on the west coast of the USA where plants can grow to truly monstrous proportions, cultivated on mounds of earth or in huge smart pots of 400 gallons (1500 litres) or greater capacity and with one or more concentric layers of trellis mesh surround ing the plant to ensure full support for long branches laden with heavy buds. Various types of trellis can be used: purpose-made rigid or flexible plastic mesh; ornamental wooden trellis; metal sheep or deer mesh fencing; for larger plants some growers even use the steel rebar mesh used in reinforced concrete, giving really sturdy support year upon year. Just be sure that whatever you use won’t cut into the stems or damage them when the plants move in the wind. An different approach to training cannabis plants is the use of small weights to gently and gradually bend branches, permitting growers to shape plants, opening them up to greater light exposure, increasing secondary branching and at the same time strengthening the branches and preparing them for the weight of the buds to come. This method can be particularly useful in outdoor cultivation, where using small weights offers the advantage of allowing plants to move and sway in the wind, which, in combination with the weights will greatly reinforce branches. Too often, branches tied to fixed points with string can be snapped or torn away from the plant in strong winds, however this can be avoided when using weights which will allow a free, more natural movement. The weights themselves should be small, not too heavy and can be improvised from many household objects, for example, steel nuts and washers attached by a thread, or my personal favourite, old wine bottle corks with a wire pushed through the centre and bent to make a hook at each end, in this way you can hang one, two, three or as many weights as needed to a branch, adding or removing as needed to achieve the perfect result. The weights can be removed as the buds increase in size and weight, this way we can make sure we don’t overload the branches and cause breakage! As you can see, there are plenty of ways to shape and train plants without resorting to damaging them and subjecting them to the stress and the risk of infections associated with “destructive methods”. By trying LST we can achieve the perfect structure for our plants, but without halting or slowing growth, vigour and vitality, leading to healthier plants and heavier harvests! Next Article How Does Marijuana Affect Blood Pressure? Get all the latest Medical Marijuana News first! We value your privacy -> No Spam Ever! Since 2015 our mission is to post Medical Marijuana News. We believe in its medical benefits and want to make this information available to the world. We started on Facebook, Twitter, Tumblr and Pinterest - over time a lot of our friends asked for a website. Here you go - Enjoy!